Have questions about workplace accommodations or the Americans with Disabilities Act (ADA)? Ask us. We can help. Have questions about workplace accommodations? Ask us. We can help. Need technical assistance about accommodations to stay at work/return to work? Ask us. We can help. Want resources about starting a small business when you are a person with a disability? Ask us. We can help. Need information on assistive technology, accessibility, or the cost of an accommodation? Ask us. We can help. If you have a question about workplace accommodations or the Americans with Disabilities Act (ADA) and related legislation, ask us. Streamline the disability accommodation process! 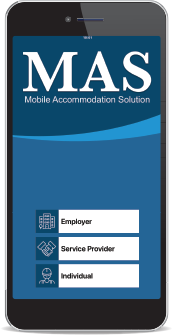 The Mobile Accommodation Solution (MAS) app is a first-of-its kind case management tool that helps employers, service providers and individuals effectively manage workplace accommodation requests throughout the employment lifecycle, from application to onboarding to advancement.